A gracefully arching shrub. 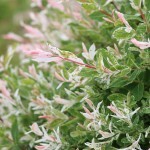 The slender leaves emerge as glossy bright pink, then mature into a white, green and pink variegation. Regular pruning encourages the best color. Stems are red in the winter. 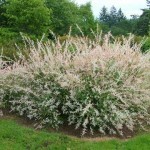 Prefers moist soils, and full sun, with some protection from the hottest summer days. 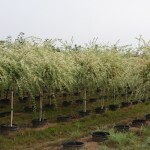 It is grown both as a shrub and as a top grafted tree.